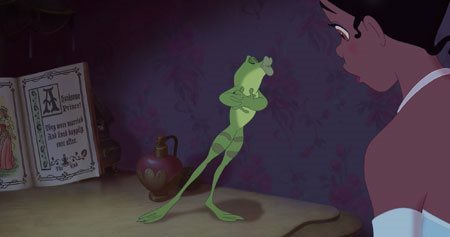 Walt Disney Animation Studios presents the musical The Princess and the Frog, an animated comedy set in the great city of New Orleans. From the creators of “The Little Mermaid” and “Aladdin” comes a modern twist on a classic tale, featuring a beautiful girl named Tiana (Anika Noni Rose), a frog prince who desperately wants to be human again, and a fateful kiss that leads them both on a hilarious adventure through the mystical bayous of Louisiana. 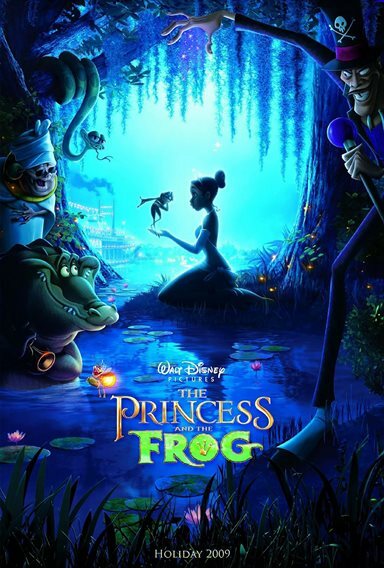 The Princess and the Frog marks the return to hand-drawn animation from the revered team of John Musker and Ron Clements, with music by Oscar®-winning composer Randy Newman (“Monsters, Inc.,” “Cars,” “Toy Story”). 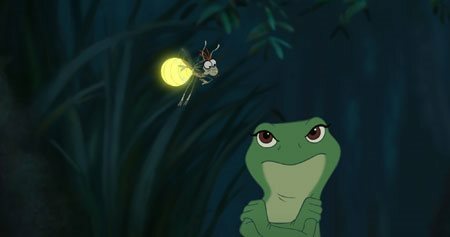 Download The Princess and the Frog in Digital HD from the iTunes store. 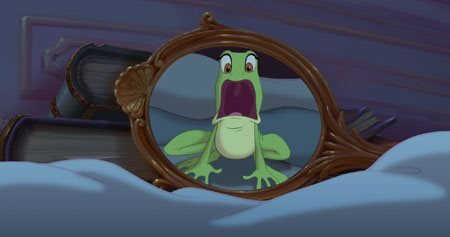 The Princess and the Frog images are © Walt Disney Pictures. All Rights Reserved. 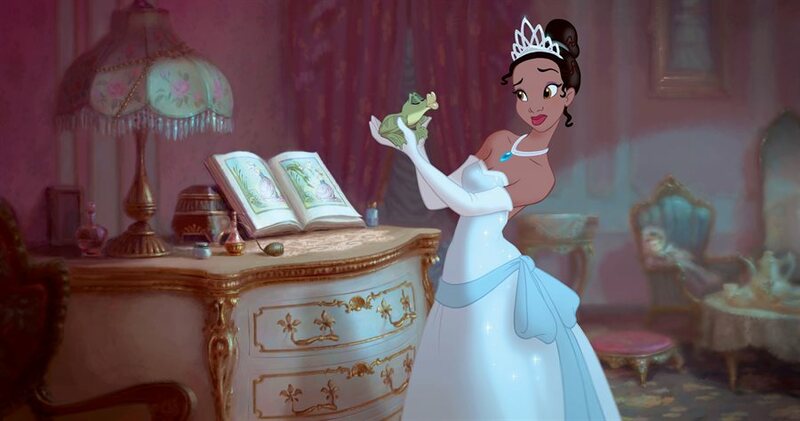 After a five year hiatus, Walt Disney Animation Studios has released the next hand-drawn animated feature, The Princess and the Frog. Based on the classic tale of the Frog Prince, this story is set in New Orleans in the 1920s, and has a twist on the original story. The princess of this story isn't a princess at all. Tiana is our "princess", and she comes from humble beginnings. Like other classic Disney movies, Tiana has only one parent; but unlike other Disney movies, you actually get to meet her father before she dies, ostensibly during the First World War. 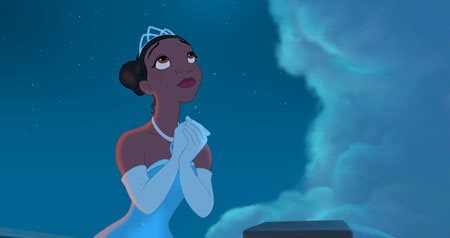 Her father is an important part of the story, as he is the one that teaches Tiana that you need more than wishing upon a star to get somewhere in life. She learned an important life lesson from her father: that hard work will lead you to better things, which to me, at least, symbolizes what the American dream is. I went to this movie with in-between expectations. 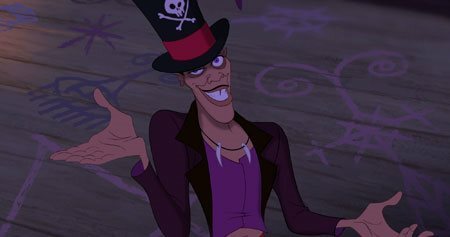 I had heard about the "twist" ending, and the good press it had received, but ever since The Hunchback of Notre Dame I've been disappointed with the quality of the work from Walt Disney Animation Studios. (Side point: I think Hunchback if they had taken out some of the childish items like talking gargoyles could have been an excellent Best Picture-kind of film). What I got was truly a film deserving of the title of "Disney Classic", with one of the best stories they have produced ever. This film, apart from the obvious point of having the first African-American leading lady in a Disney animated feature, has a story line that not only blends the dreams of little girls to one day become a princess but also the important element of the American Dream: That here, in America, if you work hard enough, you can make your own way, and see your own dreams become reality. 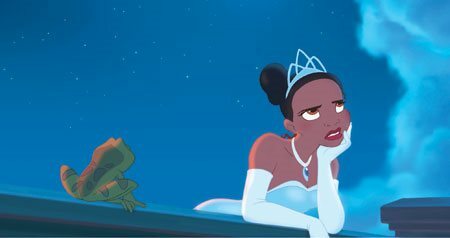 Story/Script/Plot Development (A-): The traditional story has a prince, who was turned into a frog; find a princess who he does something for to get her to kiss him, thereby breaking the spell. Prince Naveen, played by Bruno Campos (Nip/Tuck), could easily be one of the current tabloid darlings, a la ripped from today's headlines. 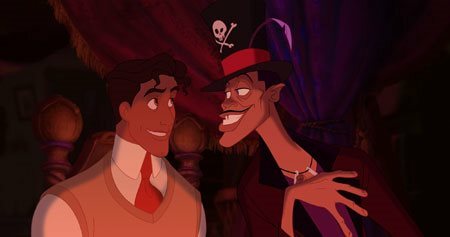 Prince Naveen would prefer to play jazz music and dance rather than be a prince in his home country, so he travels to New Orleans, where through an odd series of events he meets Tiana. Tiana is played by Tony Award winning actress Anika Noni Rose (Dreamgirls - on Broadway), and as mentioned above lost her father during the First World War. Her father taught her how to cook, and helped foster her dream of someday opening a restaurant in New Orleans. Through hard work and perseverance, Tiana finally has saved up enough money to buy a building to start her restaurant...before, that is, Prince Naveen and her cross paths. This change from the traditional story was intriguing at first, but by the end makes sense and is a wonderful and encouraging tale woven by Disney animators. The only fault I could find was there was not enough time spent on why certain characters grow during the film (not physically of course! ); this film is intelligent, and you have to read between the lines to get some details, which is something you don't see that often from Hollywood recently. Cinematography (A): Hard to truly rate this for an animated feature, but the only odd thing out was during certain sweeping visuals the background was out of focus, but I'm not sure if this was due to the print quality v. a non-digital projection theatre. The animation is top notch and leaves nothing to be desired for hand drawn animation. Acting/Chemistry (A): All of the actors but their best... voice forward you could say. John Goodman does a great job as Big Daddy, who only wants the best for his daughter Charlotte. 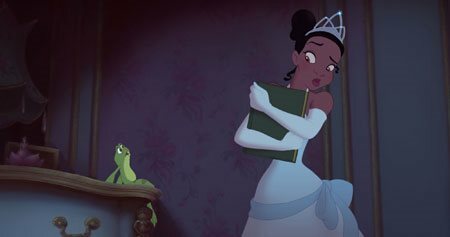 Charlotte (voiced by Jennifer Cody) is one of Tiana's oldest friends, and Charlotte wants nothing less than to be a princess. 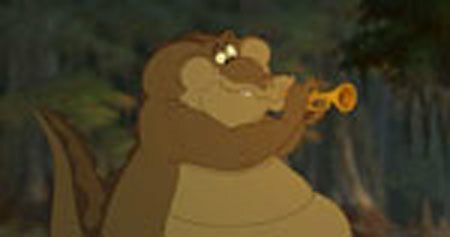 Jenifer Lewis (Cars, Strong Medicine) does a superb job as Mama Odie, the Voodoo Queen of the Bayou, and Michael-Leon Wooley is excellent in his role of Louis, the trumpet playing crocodile. 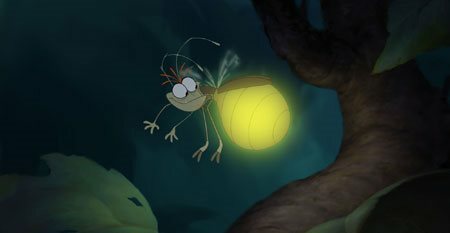 But the best performance has to be that of Jim Cummings as Ray, the Cajun Firefly. Jim Cummings is a lifelong animation voice, most recently as Tigger and Pete for Disney in some of their animated series. But his work as Ray far surpasses everything else he has done. Ray is an exceptionally unique character, as he brings the Cajun flavor to the movie and is funny without bringing the movie down with it. This is something that is very hard to accomplish. Use of locations/Costumes/Special Effects (A): New Orleans looks like it could be the 1920s in this story, and the period clothing for the characters appears to be correct. Movie Score (A): I'll admit I was worried when I first heard that Randy Newman wrote the music for this movie. And while in one song you can kind of hear chord progressions from "You've Got a Friend in Me"; this movie stands on its own and exceptional, especially the songs. While most people think "Dig a Little Deeper" is the showstopper for this movie, I think "Gonna Take You There" is the best song of the movie, followed by "Down in New Orleans" performed by Dr. John. The songs fit perfectly into the story and don't slow it down. Final Grade (A): A very strong A. This movie ramps up very quickly, and except for a short time near the middle doesn't let up. Very well paced so that young children won't get bored, although you may need to consider that there are a few scenes that could be worrisome for young children (mainly dealing with Voodoo underworld and death. Yes, Virginia, a character does die in this film, like Bambi and The Lion King) If the movie marketplace wasn't chocked full of new releases in the next few weeks I'd probably see this movie again. 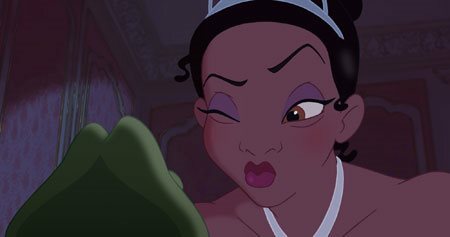 The Princess and the Frog images © Walt Disney Pictures. All Rights Reserved.